The #1 Efficiency Gains in Energy Come From…Sand? It’s clear from comments on Q2 conference calls in the last week that North American producers ARE getting more efficient—lowering costs—in producing tight oil, or shale oil. And they don’t think they’ve hit their limits yet. The high tech reason for these improvements? Simple sand. 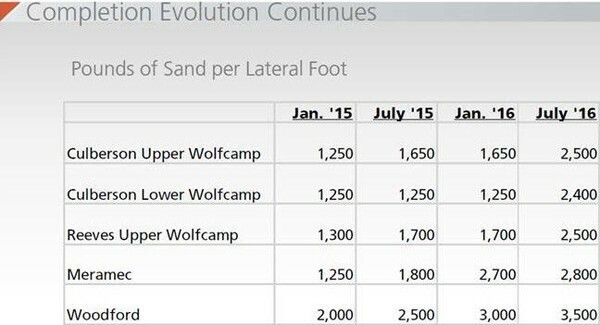 It is stunning to me how much more sand is getting used in tight oil and gas wells. They have a near identical chart for the western Delaware basin of the Permian. …with the STACK and also the Woodford, you’re putting in a lot more sand. Do you have any sense of what you think the economic limit is for how much profit you can put in? “..And then if you move over into the Anadarko Basin, we’re using a slick water job in our Woodford type work, and we continue to increase our proppant loads there. So we’re up to about 2,000 pounds per lateral foot. And after drilling and completing over 800 wells, this last large pad that we brought on had the best results that we’ve ever had in the Cana-Woodford play. No wonder the stock of US Silica has gone from $16-$40 this year—and stayed there. There’s a couple points here for investors. Data on how much oil and gas producers are getting per 1000 feet is not easy to come by. But several presentations are now showing over 3 bcf/1000 feet for natural gas—that’s very impressive. And I am reading regularly that stretching laterals from 1.5 – 2.0 miles only costs an extra 20%, to get 50% more production. The point is—economies of scale are absolutely creating lower costs per barrel. And producers would not be increasing sand use 40% if that wasn’t happening. Second, not only is an incredible amount of sand being used now, the mix in sand is changing. The Market at first used mostly coarse sand, but is now using a finer mesh. And because margins are being squeezed everywhere, producers are finding this method cheaper. Mohammad—who is actually selling sand to industrial users outside of energy—says the coarse sand actually does do a better job in the long run, but right now cheaper costs are the most important factor for producers. That cost cutting is causing the industry—and that means producers, specialty frac sand suppliers like US Silica and the big service companies like Halliburton & Schlumberger etc.—to start looking at regional sand deposits in the southern US. Traditionally, very high quality white sand, mostly from Wisconsin, has been used. 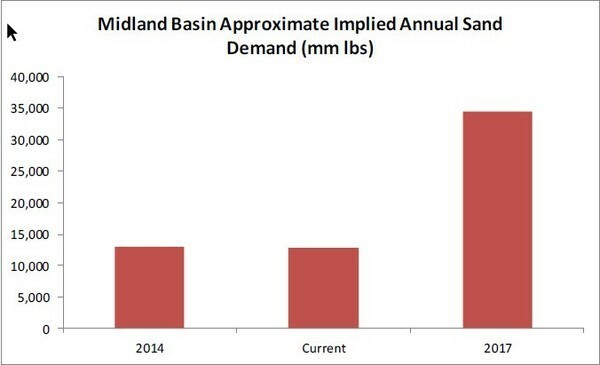 But transport costs can be high, and companies like US Silica are now buying brown sand deposits closer to Texas, where it looks like the Permian will be the most active light oil basin in North America. Mohammad’s sand has all the technical and logistical wants by the majors, and he is hopeful to land his first energy sales contract this fall. The Market is convinced there will be no more price concessions by sand suppliers, and Mohammad believes there may even be a shortage of the finer sand like the one in his deposit by Q1 2017. The industry has built and relied on the white coarser sand for the last 7 years of the Shale Revolution; this finer part of the market has been ignored and now is suddenly in high demand. EDITORS NOTE–The other VERY noticeable trend in Q2 reporting season the last two weeks? Well results in the Permian are soaring. Permian stocks will absolutely outperform every other oil basin in North America. The cheapest Permian stock I see is RIGHT HERE.